Unfortunately, about the time it seems Berlin is scoring a hit, it gets hit instead. Main Street is the heart of the downtown, and residents have been working hard to improve it. The last thing it needs is one more empty building. But Morning Lane Photography, owned and operated by Paul Charest, is shutting its doors. 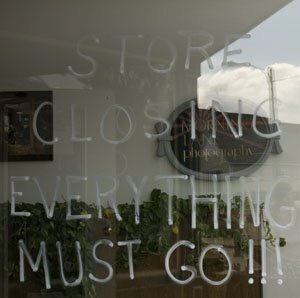 Mr. Charest said one of the hardest things to do was to write “Going out of business” on the windows. He said he apologized to the surrounding business owners before he wrote it. He is trying to sell the building too. Mr. Charest said he thinks photography isn’t going to be viable in the long term. Too many changes with digital, now everyone is a photographer. As I stood talking to him I felt the weight of my Nikon D200 on my shoulder. It, and the newer versions of it, are exactly what he was talking about. It is smarter than me when it comes to taking pictures and makes most of them come out well. Of course it and I are not immune to the forces he talked about. My D200 three years old and already is obsolete. And I am writing for a newspaper, another medium that might soon fall by the wayside. I understand his frustration and his exasperation. I live it just as he does. And just as Berlin does. This is exactly what this blog is about: Change. Berlin in changing. What will the city do about it? Journalism is changing. What will reporters, the public and society do about it? And photography is changing. What will Paul Charest do about it? Paul is doing something about it. He admitted that it was hard to close a business after 21 years, a business he’d put countless hours into, but he’s training to become an X-Ray tech. He is moving forward, looking to what he can do to keep himself afloat. He said he’s excited to be able to spend time with his family, to take advantage of not being a photographer. Has Berlin taken advantage of not being a mill town? Has journalism taken advantage of not being confined to print? Berlin and journalism: to entities rooted in trees. What will it take to move beyond them? For Berlin at least, salvation lies in technology. City councilors are always complaining about not having a highway to Berlin. Why? So Berlin can wind up like Gorham on U.S. Route 16 just south of the city line, a corridor of low-rise big box stores with low wage jobs? If Wal-Mart and Tractor Supply Co. are the best of Berlin’s future the city is aiming too low. There are better opportunities out there for the city and its residents. New highways are made of fiber optic cable, not pavement. If credit card companies can reroute telephone calls to Bangalore on cable laid across the Pacific, it shouldn’t be hard to run cable to Berlin. More and more people in Berlin are using the Internet. More and more people are creating careers for themselves while living in beautiful rural settings like Northern New Hampshire. The city has to facilitate that process and work to get city wide wireless, not pave over its historic buildings. What else does the city need to do? The same thing Mr. Charest did — get an education. The job landscape isn’t changing in Berlin, it has changed. For a city with a blue collar mindset, there aren’t many blue collar jobs left. Even positions at the prison are easier to get if you have a college degree. Residents have a wonderful resource in the White Mountain Community Center; it would behoove them to use it. Everyone could use more education, but Berlin is used to the work harder model, not the work smarter model. Residents have to get over that and learn all the things they don’t know. It is possible to do some jobs from anywhere, but it means knowing how to do those jobs. Berlin residents need to get an education in 21st century careers, because the ones that sustained them in the 20th century are gone forever. They are living in change, and they must decide if it will be a good change or a bad one.